My three year old loves all things Bubble Guppies and mommy does too! It is an easy show to watch, and makes me smile with the antics that the cute little fish (and bubble puppy) are up too. This show is no exception to the rule and I love watching it with my little man. It will be released on 5/10/16 so go ahead and pre-order it (available on both Walmart and Amazon) for your little Bubble Guppy lover. Bubble Guppies fans won't want to miss this new collection of fantastic farm-themed episodes in Bubble Guppies: Fun on the Farm, which hits shelves May 10. 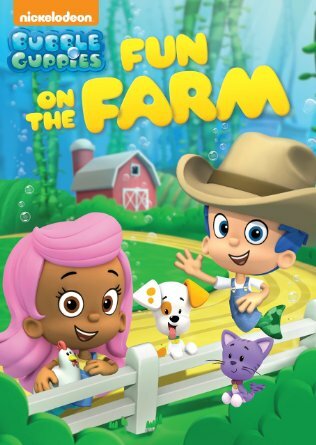 This new collection explores the world of farming as the Bubble Guppies meet new animal friends like Bubble Kitty and Spring Chicken, and join in exciting farm events like the Cowgirl Parade. In the five featured episodes, the Bubble Guppies meet new friends that oink, moo and buzz, having tons of farming fun along the way.